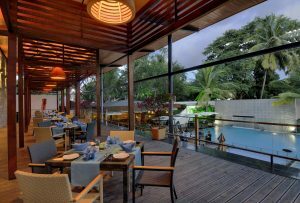 Welcome to your upscale lifestyle 5-star hotel, Grand Mercure Bangalore. Situated in a quiet, residential and serene part of the city, Koramangala, our well-appointed all-suite hotel provides an ultimate extended stay experience to all our guests with 24/7 high speed internet access in all suites. It is in close proximity to Bengaluru’s most desired hangouts, The forum mall, MG road and Indiranagar. International schools in surrounding are a highlight of this upscale locale, while stand-alone restaurants in the vicinity gives you a flavor of the city’s best cuisines. 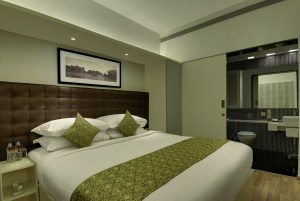 The 126 tastefully designed suites feature a range of in-room facilities for hassle-free extended stays. Bright and spacious, all the suites have a balcony, perfect for coffee mornings. A kitchenette ensures that you don’t miss your favorite meals. Complete with daybeds, all the suites offer a convenient and comfortable environment packed in one compact space perfect for relocation, business travelers and families alike. Grand Mercure if you want friendly staff, good service, quiet and yet not too far from the melting pot.